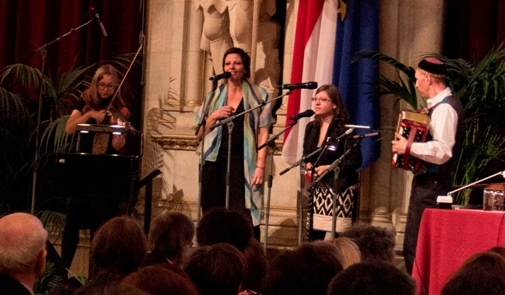 The Avanim ensemble (Daliah Hindler vocals, Karin Waniek-vocals, Christoph Kögler-accordion, guitar and vocals, Agnes Riha-violin) was created in 2009 to provide a musical accompaniment to Stones of Remembrance ceremonies where it performs regularly, as well as at other events. With its repertoire of Yiddish and Hebrew songs, it aims to provide a lively contribution to Vienna’s Jewish music culture. In autumn 2015, Avanim produced its first CD in collaboration with musicians Alfred Stütz (double bass) and Andreas Lindenbauer (clarinet).